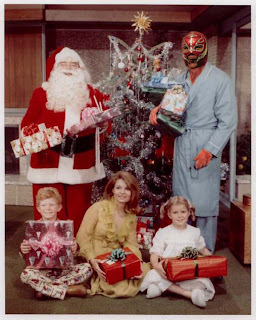 Here's a few pictures to share from your old pal El Tremendo's Holiday Tome of Memories, aka My K-Mart Photo Saver. December, 1946, New York City. 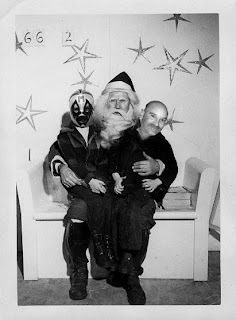 Film Geek Schu and I as little ones on Santa's lap at Macy's. The guy playing Santa called himself Kris Kringle, spoke Dutch, and sold real estate in his spare time. He was later put away in the nut house. 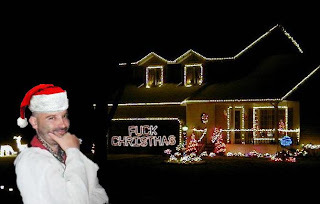 During his sanity hearing, a crucial piece of evidence arrived too late and he was hung on X-mas morning. Dang post office! Life was so much simpler back when I was a hot woman. December, 1968, Culver City, CA. I briefly replaced Brian Keith on CBS's Family Affair during season three where I was introduced as Uncle Tremendo. I was fired after body-slamming Sebastian Cabot for constantly swiping butter croissants from my dressing room. I have no idea why I have the same facial expression in all these pics. X-Mas Day, 2006, Hollywood, CA. Save the cheerleader, save my pants! A special holiday message from Film Geek Schu.